The sparkle of Christmas lights. The delicious aroma of sausages and cookies. The uplifting voices from a choir singing Stille Nacht (Silent Night). While not immediately obvious, Filipino and German cultures surprisingly find the perfect meeting point during the season of Christmas. The Philippines has the longest period of Christmas merriment, starting Christmas countdown as early as September, while Germany prides itself with quite a magical and festive Christmas celebration born from centuries of heritage and tradition. As a nation, both countries share the same kind of fondness for Christmas. Christmas in Germany is not complete without a Weihnachtsmarkt (Christmas Market). It has never been organized here – so far. 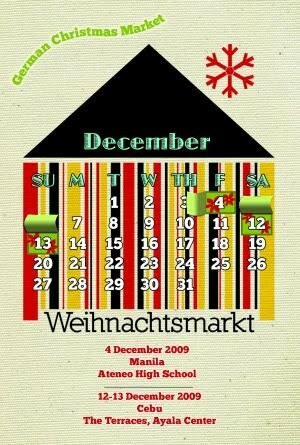 This year, the holiday season takes a new twist as the first German Christmas Market in the Philippines will be held. Dubbed “Weihnachtsmarkt 2009”, the special event will be celebrated in Manila on December 4 at the Ateneo High School (ITC-Field) and in Cebu on December 12 to 13 at The Terraces, Ayala Center Cebu. Weihnachtsmarkt aims to share German Christmas traditions, as well as familiarize Filipinos with German language and culture. Throughout the day, a variety of activities will take place: choral singing competitions, raffle draws, movie screening, cooking demos, games, trivia and photo contests, and more! A scholarship in Germany awaits a lucky winner. In Manila, a concert will feature the bands Kjwan and The Out of Body Special, while a choral competition will be the highlight in the Cebu leg, with choirs from different high schools and universities rendering their version of German Christmas carols. The venue will be designed and decorated in a similar fashion as the German Christmas Markets. Weihnachtsmarkt will also showcase a merry mix of booths selling German delicacies such as freshly baked Stollen and ginger bread, sizzling sausages grilled over charcoal fire, hearty stews with Wiener Würstchen, and other sumptuous goodies. Weihnachtsmarkt is brought to the Philippines by the initiative Schools: Partners for the Future (PASCH) and the Goethe-Institut Manila. The goal of the PASCH initiative is to establish a worldwide network of the top schools of different countries, aiming to awaken young people's interest in the Gerrman language and modern-day German culture. Furthermore, PASCH endeavors to help in creating a first-rate learning and teaching environment conducive to learning German, to prepare young people for the opportunity to study in Germany, and to promote intercultural dialogue between decision-makers of the future generation. Schools: Partners for the Future is coordinated by the Federal Foreign Office and implemented in cooperation with the Goethe-Institut, the Central Agency for Schools Abroad, the Educational Exchange Service and the German Academic Exchange Service. Students, professionals, enthusiasts of the German culture, and the general public are invited to experience the sights, sounds, and tastes of Weihnachtsmarkt2009. For the full event program and further information, please visit German Cultural Center Manila or call the Goethe-Institut at (632) 840. 5723 or 840.5724.